In South Texas flounder gigging is so popular in that it is one of the few places in the world you can hire Flounder Gigging Boats. Texas, Louisiana, North and South Carolina, Georgia, Florida, Alabama and Mississippi are the most popular areas for gigging southern flounder which grow to a very respectable 15 pounds. The boats have very powerful flounder lights and light up a massive area of water down to two metres deep. This allows them to effectively gig flounder in deeper water on the outgoing tide. The most popular flounder boat design in South Texas is a flat bottom or shallow draft skiff or dory. 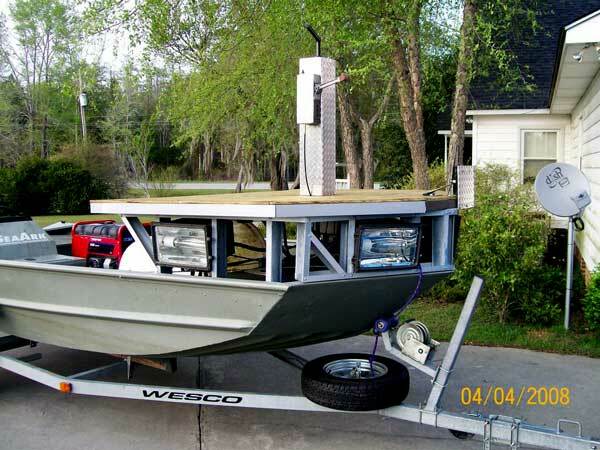 The purpose built flounder boat design below features a gigging platform with 2000 watts of halogen spotlights mounted below. A Honda generator provides the electricity to power the gigging lights. More information on the boat below and others like it can be found at this forum. In New Zealand the recent banning of set nets in the mouth of west coast harbours to protect Maui dolphins is likely to improve flounder fisheries in those areas. The problem now is, how do we continue catching them? Spearing flounder has always been popular in NZ with most flounder fishermen wading the shoreline with Tilly lamps or underwater battery powered lights. A kayak or dingy can give access to the outer banks flounder fishing but most fishers doing this still wade and tow the boat behind them. However the wading style of flounder spearing or gigging limits fishers to areas that have a firm seabed to walk on. To fish the many bays and estuaries that have softer mud and sediments on the seabed gigging from a boat like they do in Texas is likely to be the only viable option. I would be really interested to hear if anyone has used this method to gig a flounder fish in New Zealand and details of their flounder gigging boat design and lighting methods.